This cheese was made the first time by François Boursin, in Normandy, France, in the year 1957. Initially François chose the name of "Gournay" for his cheese, changing it later for "Boursin". This cheese has spreadable consistency besides its addition of an herbs and spices variety, that will make it much more tasty and provocative. 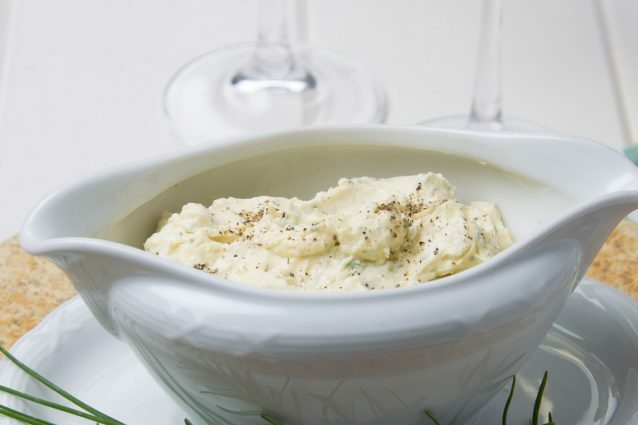 With this simple recipe you will be able to make your own boursin cheese that you will be able to offer to your guests, in order to make them enjoy its pleasant and aromatic flavor. You can serve it with pretzels, veggie sticks, toast, rye bread or you can even add it to salads or onion soup, which will give to the usual dish a special touch. I hope you enjoy it! Leave the cream cheese, parmesan cheese and butter out of the refrigerator in order to have them at room temperature. Crush the garlic cloves in a mortar and chop all the herbs finely. When parmesan cheese and butter have reach room temperature, place them in a bowl with the garlic and mix very well. Them add the herbs one by one, and stir making sure they are homogeneously spreader, before adding the next one. The herbs for this recipe can be modified according to taste; It is important to have at least four different ones. This recipe is delicious with some red bell pepper and coriander. You can make as many variations as you wish. Place the mixture in a container with a lid. Refrigerate about 3 to 4 hours. Before serving, allow it to reach room temperature. If you have a rounded bowl you can put the mixture in it and flip it over a plate to serve it. This appearance will be very elegant. You can accompany this recipe with soda crackers. It is ideal for a special occasion with family or friends. 3 amazing food decorations with pretzel! How to serve hot chocolate: you must try it! Baking soda cooking hacks you must try! 2 ingredients recipes: ready in just a few minutes!